Just tested it in the back yard. At 21ft, it produces third to quarter-inch groups — single action, with very close attention paid to the trigger control. It comes with a bore brush and taller/lower front sights. The weight and the balance are pretty similar to the real SW586. Compared to my old Crossman air gun, it’s both heftier and sturdier, the installation of the CO2 cartridge is MUCH easier. 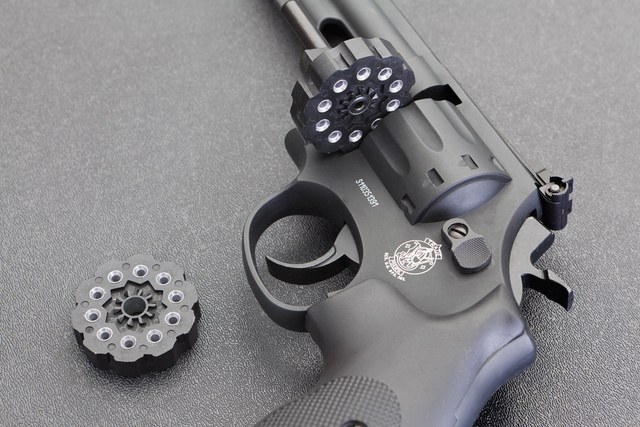 The changeable 10-shot “cylinders” are anodized metal. The trigger pull is heavier than with the real gun and a bit rougher. Not ideal for match target shooting but perfect for training in place of the real firearm. Accuracy seems sufficient for a squirrel-sized target out to about 20 yards. At 400fps, the power level is probably more suited for pest birds like starlings. Shooting my air guns without having to go far is definitely relaxing. Pity I can’t do the same with the quiet 22s. 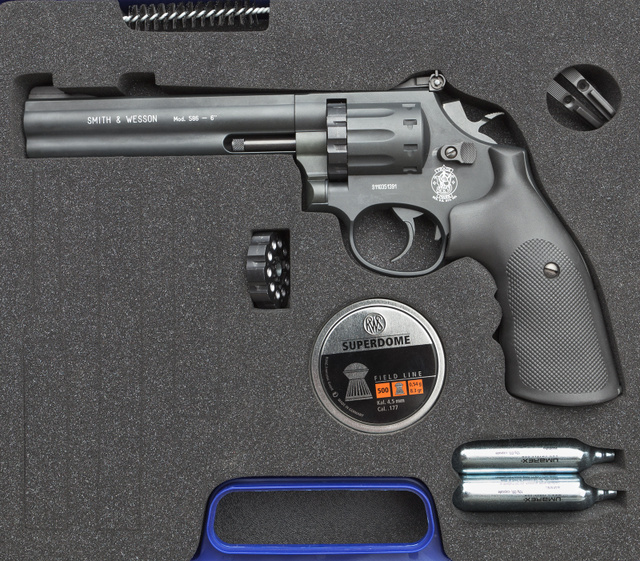 This entry was posted in pistol, training and tagged .177, air, C02, pneumatic, revolver. Bookmark the permalink. Great to see this. I had a similar one from around 1990 or so, may have been the crossman. It had a break action though and over time, the locking mechanism wore out. The cylinders were also made of plastic vs the metal here. Call Crossman — $5 of parts would fix the locking tab. Looks built a great deal better than the Crosman 3357. Wonder if it uses the same gas system, or if they perked it up a bit. My Crossman was a tip-barrel, this one isn’t. I suspect the other details differ a bit as well.